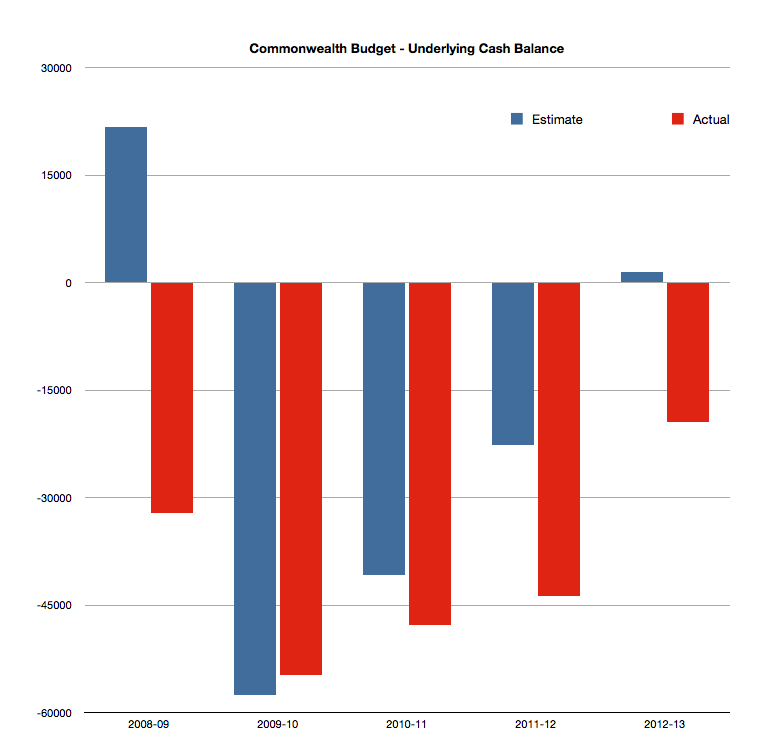 … the Rudd/Gillard/Swan Labor government still could not balance the budget. If you cannot manage a budget, you should never be allowed to manage other people’s money. * The Final Budget Outcome (FBO) for 2012-13 has not yet been released by Treasury. Presently, the “estimate” is -$19.4 billion. On past form, the FBO is sure to be worse. You wouldn’t find too many (individual) pollies who could manage their own household bugets, let alone the nations’. A bit unfair taking the Abbott line about their surpluses when Labor governed through the GFC. You never see this mentioned. The problem with politics in general is that bith sides keep making promises which the nation cannot afford, promises which are then hard to take back for fear of being kicked out at the next election. My forecast: Abbott will sack workers to reward the rich and keep sacking until the budget is back in the black. What a way to govern!! And of course he will more than likely can promises as ‘we can’t afford it’ now that he has the reigns. A society gets what it deserves. The whole point of this post, and beginning with the ToT chart, is to debunk this rubbish that Labor and its rusted-ons have kept throwing out there to excuse their (and Treasury’s, it should be said) utter incompetence. The ToT chart proves the GFC only had a very brief impact on our economy … it only fell to approx. the same level as it was when Labor came to power, then quickly rebounded, to scale new record heights. Labor had record ToT going in their favour … and still could not get within a bulls’ roar of balancing the budget. Too many promises and waste. On this I agree. From Steve Keen. To my surprise, I agree with much – not all – of it. Worth a read. Thanks JMD, read it earlier. I broadly agree with Steve’s analysis there re “timing” of governments coming to power … with the caveats that I think he overstates the importance of Labor “stimulus”; completely ignores the abject failure of Labor to get the budget back under control as the ToT rebounded strongly on China stimulus; and (as usual) in his obsession with private debt, he fails to recognise that weakening the government balance sheet via the fastest ramp-up in government debt in the OECD — given the Feds balance sheet underpins the State’s debt, and more importantly, the entire banking system and its credit rating — means that Labor’s budget mismanagement has paved the way to an even greater scale disaster than if we had got a much-needed private debt deflation out of the way. All the Feds did, is kick the private debt can down the road, and by radically weakening the govt balance sheet as well, set the stage for the debt bubble to get bigger, and include more people, before it crashes. That’s because he regards government debt as ‘money’, which is why I don’t take a lot of notice of him. One Power Index informant remembers Shorten grabbing a seat beside Button at a dinner and bending his ear for half-an-hour, at the end of which the shocked senator told the person on the other side that Shorten had been seeking tips on how to become prime minister.